Mask of Death & Rebirth, maya masks, pre-columbian masks, mask of rebirth, maya reliefs, maya art, pre-columbian art, mesoamerican art. This Maya mask shows the different stages of life as part of a never ending cicle of human evolution through life and the afterlife as it was understood by the mayas. 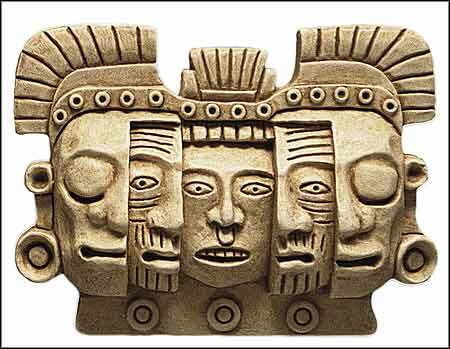 The mask has three layered faces, each representing one particular stage of life. The inner face represents the beginning of life at birth. The middle face is the most important one since it represents the adult stage when the person comes into his full potential and most of his life experiences happened. The outer or third face represents the end of earthly life. This sacred time was viewed by the Maya as the end of one cycle and the beginning of another one. Death was followed by lavish preparations for the next life.